The changes mandated to Regulation A in the JOBS Act are among the least heralded yet most promising prospects for small business capital formation. The SEC adopted sweeping changes to Regulation A on March 25, 2015 to take effect 60 days after posting, in late May or so. The “elevator speech” summary of the proposed rule is that the amount an issuer can raise using this “mini-registration” exemption will increase from $5 million to $50 million, and the shares sold will be freely tradable. As was true of old Regulation A, the exemption cannot be used by “blank check,” extractive industries like oil & gas and mining companies, reporting companies, certain investment companies, and issuers affiliated with a “bad actor.” The rarely used “test the waters” process remains available to filers and may be used more frequently now. All Reg. A issuers are now subject to antifraud liability imposed under Section 12(a)(2) of the Securities Act of 1933. The standard for liability here is much lower than under Rule 10b-5. Seller beware. As there is with most proposals, there are several “yeah buts.” The SEC created a two-tiered system. Under Tier 1, an issuer can raise up to $20 million. There are no minimum investor qualifications, and only reviewed, but not audited, financials are required. Sounds good. Yeah but, the offerings are subject to both SEC and state review. An issuer can opt instead to proceed under Tier 2. The states are preempted from reviewing Tier 2 deals. Yeah but, audited financials are required, sales are limited to accredited investors or non-accredited investors who invest no more than 10% of their annual income or net worth, and quarterly, annual and material event reporting is required. Sales of insider and affiliate shares are restricted under both Tiers, $6 million under Tier 1 and $15 million under Tier 2, with both limited to 30% in any trailing 12 month period. At least one “elephant in the room” in the Reg. A+ debate was “merit review,” the “M” word. It was the M word that almost tore apart the North American Securities Administrators Association (“NASAA”) in the early ’80s, that doomed the Revised Uniform Securities Act of 1986, and that, in large part, gave rise to NSMIA in 1996. Merit review was the heart and soul of the original “blue sky” laws, the authority of state securities administrators to deny securities registration to an offering that, in the administrator’s view, was “unfair, unjust or inequitable” to, or would “tend to work a fraud” on investors. At its height in the ’70s and ’80s, about 36 states applied merit review standards to new offerings already reviewed for disclosure by the SEC. While laudable in intention, making decisions based on those standards proved challenging to enforce and defend over the years. Various regional groups of regulators formed in an effort to develop regulatory guidelines for all to see. NASAA eventually assumed the role, and its committees of state analysts continue to hone “merit” standards for those states with the authority today. However, in NSMIA, Congress reduced the number of offerings subject to state registration review to a trickle. Reg. A deals currently are in that shallow pool of state-reviewed offerings. The goals of merit review are among the most misunderstood in American finance, by critics and perhaps state regulators both. Detractors scoff at the idea that some state examiner in “East Dakota” can predict whether a company will be a good or bad investment, whether the investor will make or lose money. But that is not the idea. Merit standards are intended to make an investment “fair” to the investor. It is not intended to be a predictor of profitability (although one can argue it makes an offering more attractive). Two classic (and often the most nettlesome for issuers) examples of merit guidelines relate to repayment of principal loans and “cheap stock.” Merit states place tight restrictions on issuers using investors’ money, offering proceeds, to pay off prior loans made to the company by its principals. Instead, offering proceeds must be applied to the company’s operations, to generation of revenue and, with luck, profits. Also under merit review, company insiders are required to place some or all of their promoters’ shares aka “cheap stock” (shares they received from the company for nothing or at a price much lower than the price investors will pay for the registered shares) in escrow until such time as the overall value of the company has increased in an amount proportional to that “cheap stock”/public price differential. In an effort to persuade the SEC that the states should not be preempted for Reg. A+ offerings, NASAA adopted a central, coordinated registration regime wherein one examiner is appointed to review disclosure and another for merit issues, purportedly with the authority to speak for all states. Further, NASAA members adopted a resolution that its merit member states should waive compliance with these two major merit roadblocks. Whether the state regulators adhere to these collective pronouncements when back home is another question. Whether a position taken by an administrator carries through to that line examiner in East Dakota is another concern. Regulation A+ has great promise. While it may not seem like such a big deal for issuers and counsel on the coasts, even the $20 million threshold is plenty for mid-American companies ready to make a public splash. There will be some cache in their being able to say the offering was submitted to and reviewed by regulators (even though there are limits on stating that fact) as opposed to private (and not so private) offerings under Rule 506. The next ingredient necessary to make either Tier of Reg. A+ a success is for regional broker-dealers—many of them beaten to a pulp over the last few years over some very large and notoriously fraudulent private placements—to emerge and seize this market. Reg. A will be the focus for that next-step, small company market, if it happens at all. As for NASAA, merit review and Reg. A+, I am torn. On the one hand, if state review is streamlined to involve only two state examiners, one from a disclosure state and one from a merit state, with some of the toughest merit standards waived, one might ask “what’s the point?” Isn’t the SEC’s review enough? The SEC pledges that Reg. A+ offerings will receive the same degree of review as full S-1 registration filings. On the other hand, these deals are more likely to be smaller regional offerings, and who really believes an examiner sitting in an SEC cubicle in Washington, D.C. has the perspective necessary to understand an offering to be made to investors in “East Dakota?” And even if the examiner has such perspective, is that the highest and best use of the SEC’s resources? On balance, the SEC was wise to give the states a shot at jointly handling the Tier 1 offerings and raising the Tier 1 ceiling from the originally proposed $5 million to $20 million. This is akin to the $100 million asset split in investment adviser regulation. Let the states man the laboring oar on these more localized offerings and see what happens. Further, the SEC’s suggestion that SEC and state examiners work jointly on review is an excellent idea, as opposed to the states getting a finished SEC product to review. Now that the SEC has given the states the opportunity to participate in the review process, the state administrators have got to take the lead with their staffs. Whether it be by weekly sit-downs with line examiners, or some other check and balance, state administrators must make sure their personal policy “seal of approval” is on every position taken by their examiners. It will only take one or two “horror stories” to ruin it for state authority across the board. “Rogue” examiners and states will not be acting solely for themselves in “East Dakota” but for every state securities authority in the country. All states must remember the three guiding, state regulatory “P” words: Principle, Politics and Preemption. And not necessarily in that order. Reg. A is no longer merely the answer to a securities trivia question. It may become the best thing to come out of the JOBS Act. Only time will tell. What follows is a table in which some of the more salient features of the two tiers are laid out. After that, I discuss some practical considerations that may give some perspective on what the new Regulation A will and will not mean for those awaiting its promulgation. Before the small company issuer community uncorks the champagne, it is important to recognize some practical realities and limitations about the new Regulation A regime. SEC Review. Both Tier 1 and Tier 2 offering statements will be reviewed by the SEC’s Division of Corporation Finance examiners, and Corp Fin is on record as stating that Reg. A offering statements are subjected to the same regulatory scrutiny as any S-1 registration filing, applying Regulations SK disclosure and SX accounting standards. Preparation of a Reg. A offering statement is going to require significant legal and accounting expense. Registrations by Qualification. At the state level, Regulation A offerings are registrations by qualification, i.e., full registrations, akin to S-1 filings with the SEC. There is no Reg. A exemptive complement at the state level, nor did the SEC impose Reg. A on the states. At the state level, registration by qualification filers are usually required (either by state statute or rule or both) to provide audited financials. So, under Tier 1, although the SEC will not require them, the states might and might have to require them (absent waiver authority), making the Tier 1 waiver rather meaningless. Merit Review. Generally, merit states have the power to limit sales by insiders and affiliates more strictly than the SEC’s Tier 1 limits. Even with waiver of loan repayment and cheap stock guidelines, merit states might pose problems here. Merit review can be avoided by selling shares exclusively in those states that do not apply merit standards, i.e., the “disclosure” states. Financials. At least in middle America, offerings of more than $10 million by early stage or other lesser known private companies are likely going to have to be made by one or more broker-dealers to succeed. Will these broker-dealers be willing to take on an offering by such a company that does not have audited financials, regardless of what the regulators require? Reporting. It is one thing to say that shares will be freely tradable, and another to say there is a market for them. Will broker-dealers be able to market the shares to investors on the basis they are freely tradable if the company does not commit to making periodic, public reporting? Will the Tier 1 reporting waiver even be relevant? Suitability. While there may be no investor qualifications in Tier 1, and only limited qualifications in Tier 2, the SEC did not exempt broker-dealers that sell the securities from their suitability obligations. Will such offerings be “suitable” investments for non-accredited investors, even if the investors are investing less than 10% of income or net worth? FINRA. How will FINRA’s Corporation Finance section handle these new Reg. A offerings made by their member firms on behalf of client issuers? Will FINRA apply full registration review to the offerings, or will the deals be treated as some sort of exempt offering with lesser or no standards imposed? It is highly unlikely FINRA will ease its suitability requirements on broker-dealers. Nor are the states likely to do so. Section 12(a)(2). Under this section of the Securities Act of 1933, a “seller” of securities is liable to the “buyer” for making any untrue statement of material fact or for omitting to state a material to the buyer that makes what was said misleading. (Unlike under Rule 10b-5, there is no remedy under Section 12(a)(2) for a seller defrauded by the untrue statement or omission of a fraudulent buyer.) The only defense under 12(a)(2) is that the seller did not know, and reasonably could not have known, of the untruth or omission. The seller is strictly liable for any such material untrue or omitted fact unless the seller can establish he was not negligent in not discovering the untruth or omission. That is tough to do. Most other liability under federal securities law requires a much greater degree of seller intent to defraud or scienter than under Section 12(a)(2). This section lost a lot of its punch after Gustafson v. Alloyd, 513 U.S. 561 (1995), when the U.S. Supreme Court ruled it applied only to “public” offerings. Congress breathed new life into the provision in the JOBS Act when it made those who offer and sell under Regulation A (and the crowdfunding exemption, whenever those enabling rules are promulgated) subject to Section 12(a)(2) liability. This constitutes important and very potent new issuer and seller liability. Crowdfunding. With the exception of the Tier 2 investor qualifications, there are no other limitations imposed in the new Reg. A on how the offerings may be offered and sold. So, an issuer can employ crowdfunding to sell its offering once it has been cleared for use by regulators. It remains to be seen if up to $50 million offerings can succeed using crowdfunding. SEC Registration. 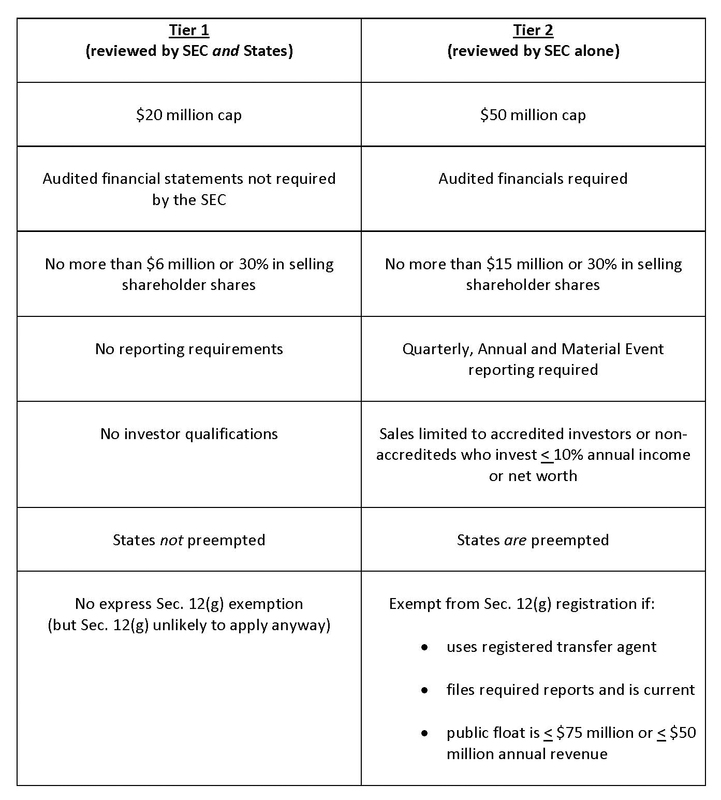 With both the new Regulation A and Rule 506(c) (publicly offered private offering solely to accredited investors) in place, it is hard to imagine why any company not already public would register an offering of less than $50 million (unless a “blank check,” oil & gas or penny stock offering or “bad actor” disqualified) with the SEC. Venture Exchanges. The idea of establishing an exchange to complement the tradable shares sold in Reg. A offerings as well as secondary market shares of other, lesser known companies has gained some traction of late. None exists at present save for “pink sheet” trading on the Internet. Lack of liquidity is a chronic problem in small company investing. It makes it difficult to sell the shares in the first place, and later down the road. The balancing factor is the hope the investor is getting in on the ground floor of the next Apple, Microsoft or Google. Independent analysts are unlikely to follow such small companies in any significant strength, leaving understanding the company and its future to the individual investor, with limited reliable public information on which to base an investment decision. It is entirely unclear how a centralized marketplace for these lesser known securities would be able to operate at sufficient volume to make it worthwhile. Will broker-dealers, market makers, independent analysts and serious investors pay any more attention to such securities on a venture exchange than they already pay to them on line as “pink sheet” companies? Pink sheet shares are far more often accompanied by questionable Internet hype, shorting and momentum trading than fundamental valuations. How will an exchange improve that situation? There is much to do before any such concept comes to fruition. This entry was posted in Merit Review, Regulation A+ and tagged merit review, regulation a by Phil Feigin. Bookmark the permalink.